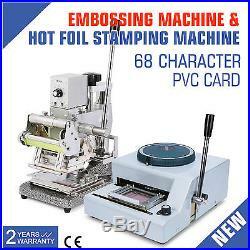 Embosser & Hot Foil Stamping Tipper Machine PVC Card Making. Card Manual Embossing Machine and Hot Foil Stamping Machine are the essential equipment of PVC card’s post production and processing, which is perfect for personalization of your VIP cards, club cards, membership Cards, gift cards etc. 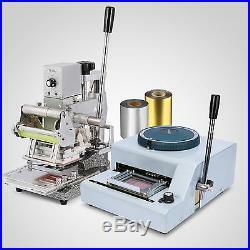 These two machine will make PVC cards identified or exclusive by printing convex characters on them. This product is widely used for: Printing or hot stamping your own design, logo, pattern or texts on paper, leather, plastic, cloth, PVC cards, etc, with excellent stamping pressure. 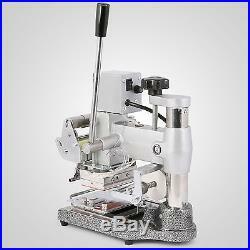 PVC Card Embossing Machine. 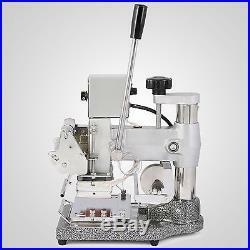 Manual PVC Card Embossing Machine. Heavy Duty Steel Construction. 26 Capitalization Case of English Letters. 20 Capitalization & Lower Arabic Numerals. 2 Correcting Characters (1 for Small Characters, 1 for Large Characters). Easy to Use with No Skilled Training Required, Just Turn the dial to the Character you Want and Pull the Lever. Indicator and Sample Card For Raised Type Location Indication. 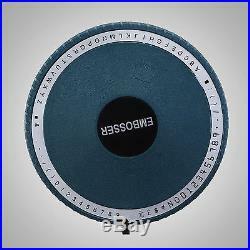 7 Characters or 10 Characters Per Inch Adjustable and 11 Lines of Embossing. 2 Correcting Characters For Error Correction, to Press Small Characters or Large Characters Flat. Character depth can be adjusted to users specifications by adjusting portion located towards the bottom of the machine Hardware is included. Kindly Notice: Due to the effort saving design, please do not pull the lever too hard during your operation in order to protect the machine. 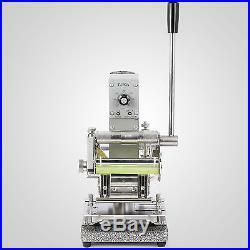 Hot Foil Stamping Machine. Stamping Height Adjustable Adapting to different substance. Automatic Foil Advance and Adjustable Foil Paper Feed. Temperature Can be Adjusted According to Different Materials and Prints. Made of 100% stainless steel which can make useful life longer. Adopt top-quanlity vessel which can make useful lift twice longer than ordinary vessel product. 1 roll of FOIL is Free. 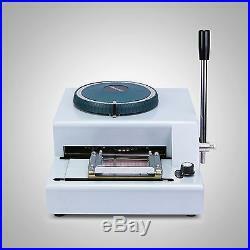 ISO9001 quality certifications which means this item is the top quanlity item. (26 capital English letters): AZ. Capitalization & Lower Arabic numerals (20):09. Machine Volume(L×D×H):340mm×300mm×180mm. Net weight:8.8kg. Voltage:110V-120V, 60HZ;220V-240V, 50HZ. Adjustable Temperature:0 – 200 °C. 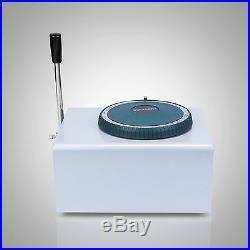 Hot Plate Size:2.36″ x 3.54″. 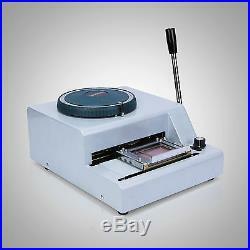 Work Table Size:5.5″ x 4″. Overall Dimension:280mm x 150mm x 380mm. Net Weight:11.5KG. 100-150 Applicable stamping:PVC Leather Soft adhesive Business card paper. 150-180 Applicable stamping:Rubber PVC card Wooden products. 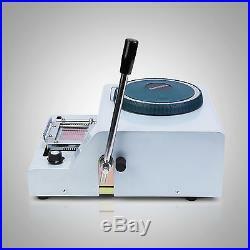 1 x PVC Card Embossing Machine. 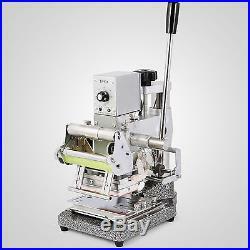 1 x Hot Foil Stamping Machine. 1 x Sample PVC Card. 2 x Roll of Foil Paper as Free Gift. English User’s Manuals. Sign up to newsletter. As a leading and emerging company in manufactory and exporting business, we are specialized in Business and Industrial Products, Sporting Goods, Pet Products, Home and Garden products for more than 10 years. We believe that it is our vision and mission to provide innovative products with best service and competitive price to satisfy you. Our goal is to make sure that you can find exactly what you are looking for and make it easy for you to place your orders. If you have any changes, pls inform us. 7:00am-13:00pm (Berlin Time). In the same day. These charges are the buyers responsibility. If you need to return, please check twice to confirm the item not work and contact our customer service representative, let us know the detailed problem and send us some pictures for confirmation. Please make sure that item has NO man-made sabotage. Used items will not be accepted for return. All emails will be responded to within. Leave a Message if. You want to cancel an order. If you need further assembly instructions for a product. Any other unspecified questions or concerns. Special circumstances will be listed clearly in the listing. Please do check everything carefully after you received the parcel, any the damage except DOA (Dead-On-Arrival) would not be covered if it’s your fault. A: The item ships from Bremen, DE. A: Please log on your account. Q: How do I return an item? Please contact our customer service before you return an item. The item “68 Letters Card Embosser Embossing Machine+Hot Foil Stamping Machine Printer” is in sale since Tuesday, November 22, 2016. 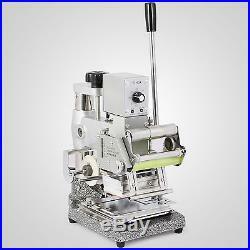 This item is in the category “Business, Office & Industrial\Printing & Graphic Arts\Hot Foil”. The seller is “industry-village” and is located in Bremen. This item can be shipped worldwide.